If you’re looking for a safe, fast and painless solution with long lasting results, Panasonic’s IPL technology enables you to remove unwanted hair in the comfort of your own home. Using Intense Pulsed light, the light travels through the skin until it strikes the hair shafts or the bulb. The light is converted into heat, destroying the hair-producing papilla which over time can reduce the growth of unwanted hair. End the hours spent on hair removal - the extra wide flash window enables you to cover large areas of skin quickly, ensuring a fast treatment with no damage or pain to your skin. With 3 seconds per flash and a short waiting time, you can cover both legs in less than 10 minutes. The five intensity settings enable you to use the treatment across your body, including your arms, under arms, legs and bikini line. Starting with setting 1, as you progress through the course of treatments you can increase the intensity to ensure gentle yet effective removal. 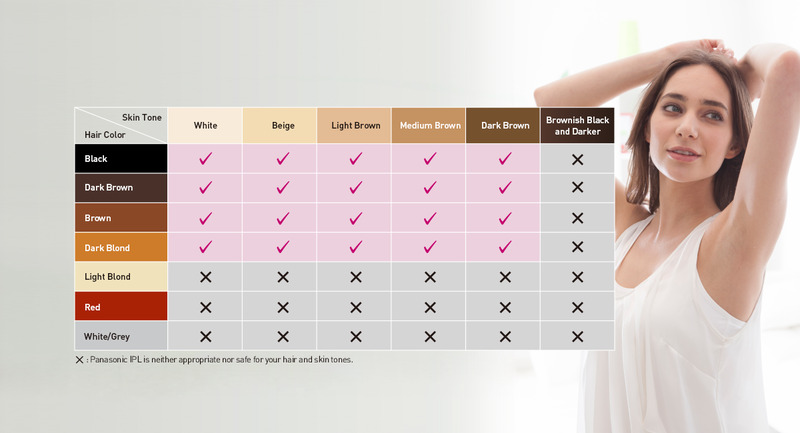 With an integrated UV filter to protect your skin, the more you use it, the lighter your body hair becomes. Long-life Li-ion batteries provide over 600 flashes per charge, allowing you to enjoy convenient cordless operation for mess-free operation anywhere in your home. The more you use the IPL, the smoother and more hair-free your skin will be. What type of light is emitted from the flash window? Instantaneous flash from a xenon lamp. Why can the appliance be used only by those over the age of 18? This is because of unstable hormone balance when growing up and the skin can become sensitive easily. Can the appliance be used in areas other than underarms, arms, legs or bikini-line? Is it alright to use the appliance everyday? Using the appliance on the same area everyday is not recommended. Please follow the guide for treatment frequency and time. Why is there a burning smell after a flash? This is because the flash applies heat to unwanted hair, and is not a sign of a malfunction. Remove any hair if it has grown too long. Also remove all trimmings remaining on the skin. The light feels very bright while using the appliance but is this a problem? Apply the flash switch closely against the skin. If the light is still a concern, wear sunglasses or other eye protection.